Love the colour of the floor - sat here feeling slightly jealous looking a my dodgy cream carpet! 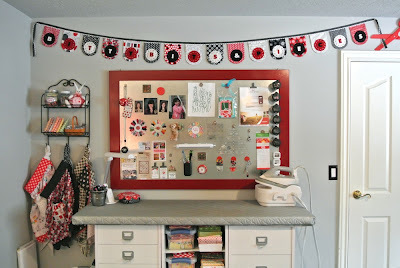 Your sewing room is beautiful Kim. Enjoy! Surrounding yourself with beauty must give you inspiration every day. 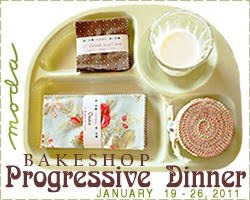 Thank you for inviting us in. 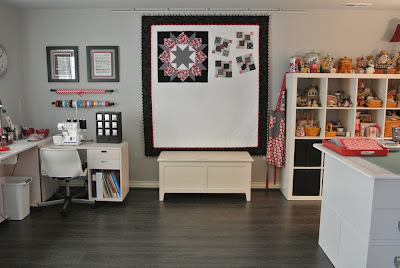 I don't know if you saw my post on Amber's blog or not, but I am sooooo LOVING your "new" room!! 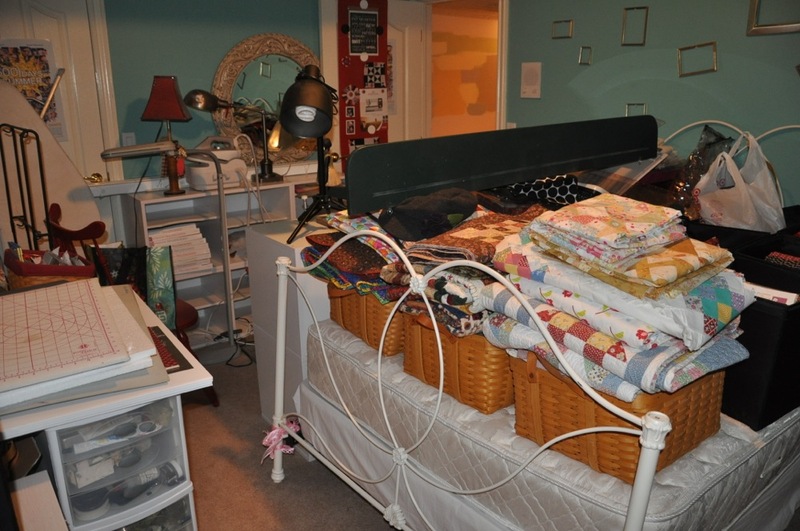 I adored your last room :), and I almost fainted when I saw the glory of the new room!! 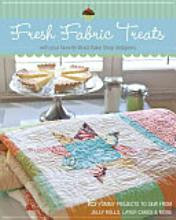 Oh, how I dream of having a room so lovely one day :) It is absolutely gorgeous and the Kim accents are just incredible- the quilt design wall- drool :) Just amazing!! And gray laminate- yummy :) Seriously, I may just have to come by and stand and take in all the wonderfulness of it :) I am sooooo happy for you and know you must enjoy your space! Yipee!! Thanks for the tour! Your room looks fantastic. 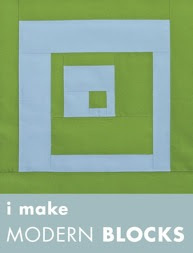 I love the design quilt and you swoon block is the nicest I've seen. Happy Easter to you. 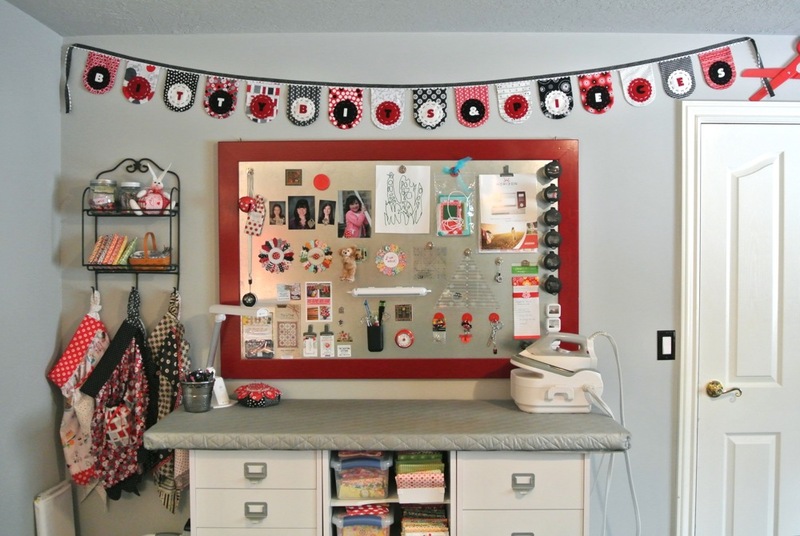 WOW, your sewing room is beautiful!! 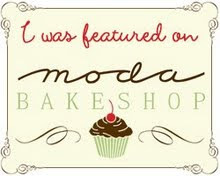 First of all I love the new look to your blog. The pinwheels are so cute. I did see this post on Amber's blog. And when you posted it I read everything again, plus the things you added. I love your room. What a perfect place. Funny thing, my monitor didn't show the old room as pink carpet, I always thought it was tan! Your flooring is fabulous and will be so nice and easy to clean up threads off of. 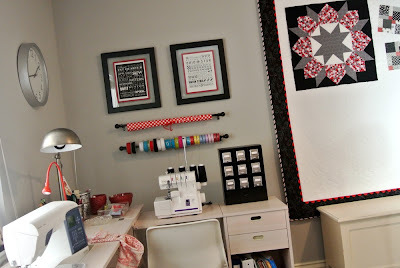 I love so much about this room and it just gets me so excited for my own sewing room redo that I'll be doing this summer after my daughter gets married. 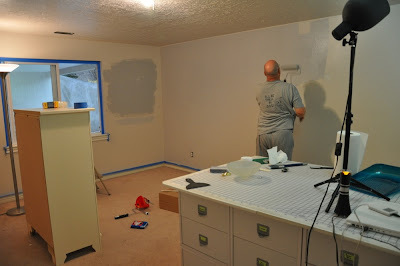 The room I redid before was my son's and he wants to stay in there even though it's smaller so I get the bigger room. Pros and cons to both rooms but I can hardly wait! 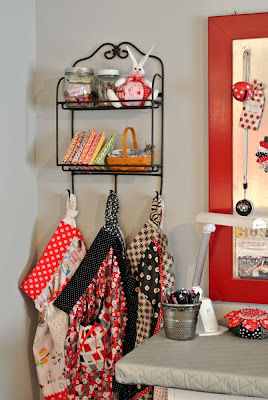 I love those thimbles and your design wall is so unique and fun! Thanks so much for the tour. 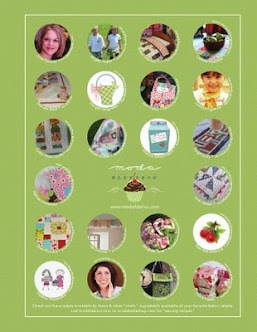 I'll definitely be using it for inspiration for my own redo after June! Love it! P.S. I found my big scissors at Hobby Lobby. They're not red but they're huge! Thought maybe you'd like to look there if you want more scissors. Gorgeous room and full of ideas! You've inspired me! Enjoy your creative nest! 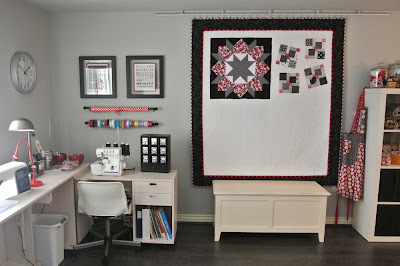 Love the design wall quilt and the thimbles. I am having a lazy Saturday morning bloghopping and came across this. WOW! What a great room. 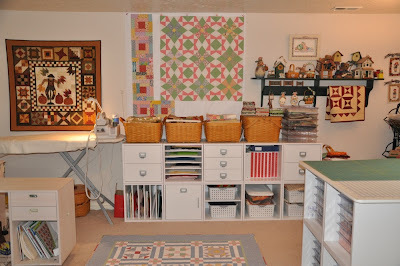 I have a large studio behind my living room that is also a work in progress but has to be used to host a monthly quilt group so I cannot go with everything I would like in there. This is a dream room and makes me want a private room too. 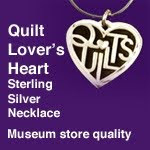 We quilters/stitchers don't want much in life do we??? Lol! So pretty! Looking around for sewing room ideas and found you. Mine is a work in progress. Love how you have used all your Longaberger. 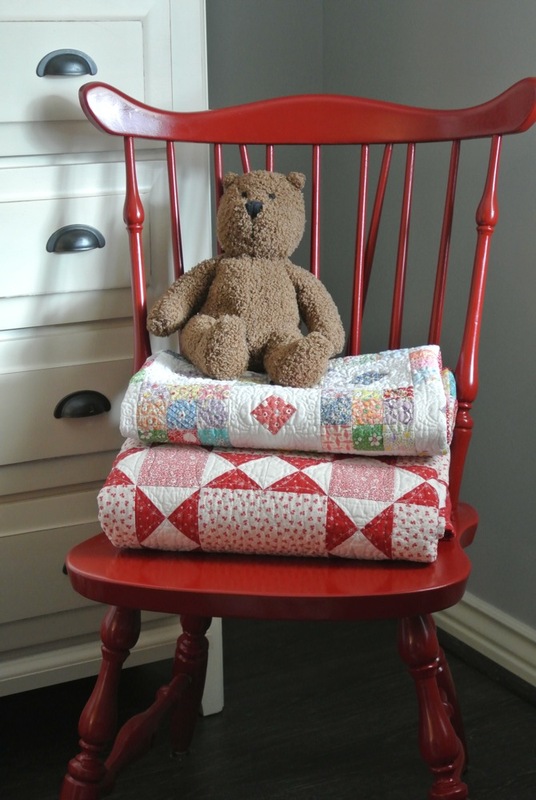 Where can I find the pattern for the beautiful vintage inspired quilt you showcased? It's gorgeous!! get out! 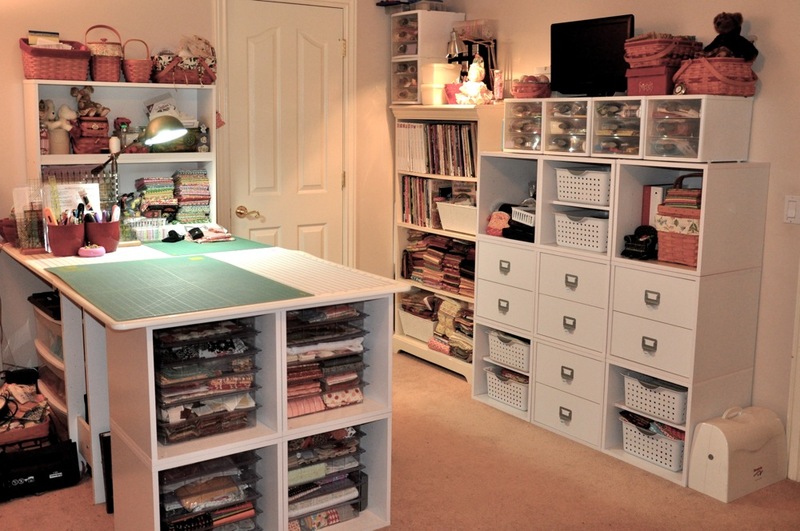 that sewing room is amazing! love it! so jealous, totally want to move into your sewing room. Wow, what a great sewing space you have! I love those thimble buckets! Too cute! What a beautiful room! I really, really love your cutting table! 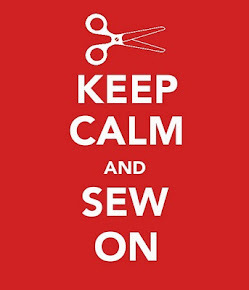 I just finished Moda's tour of sewing rooms and I had to come back and say that I still think your's is the best and most inspiring. 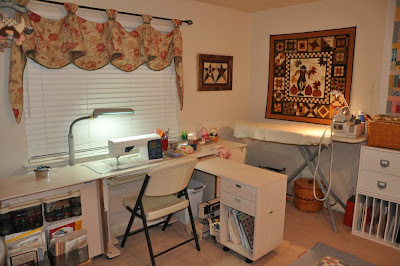 I was surprised by one designer who's sewing room was so plain. I wondered about that. I'm almost finished with my room, just waiting for two wall hangings to come back from the quilter to finish it off. It's taken me eight weeks of painting and working to get it ready. It's been a satisfying redo for sure. 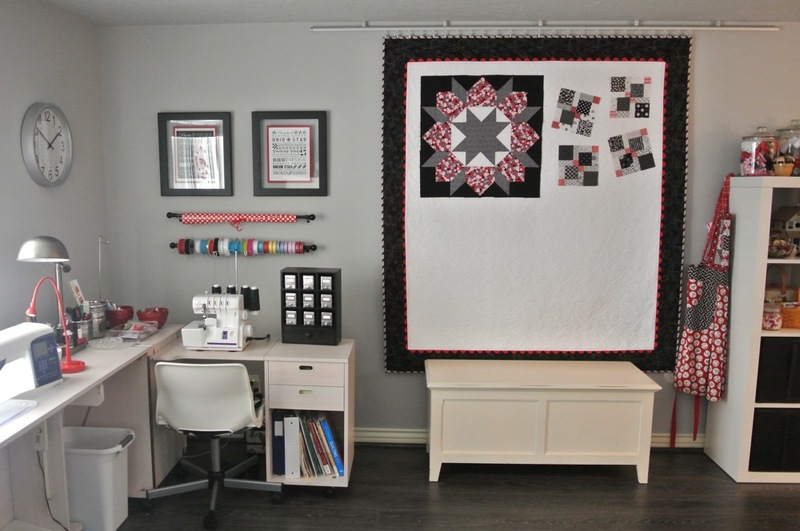 Thanks for sharing your inspiring room Kim! 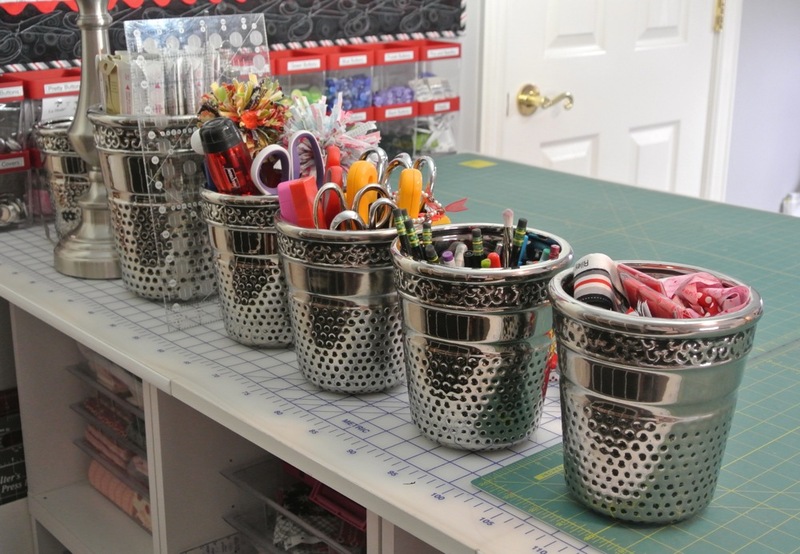 Those thimble pots are....just awesome!!! Beautiful space! 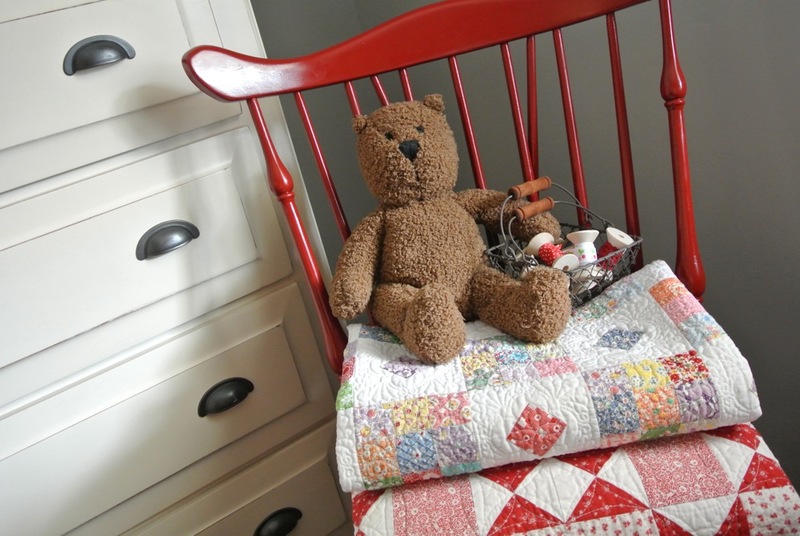 Those thimbles are fantastic! love it! 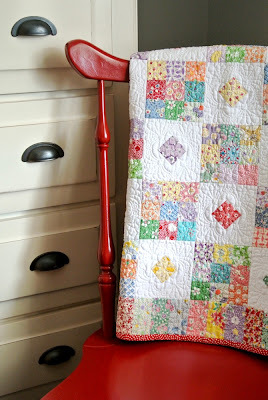 i have stained concrete floor-- thinking i might need some of that laminate! would love to know where you found your cutting table. Did you make it yourself or buy it. I need a table that is taller than most because I am tall, and would love to adapt something. Just wondering about your cutting table with the drawers. Did you make that or buy it? 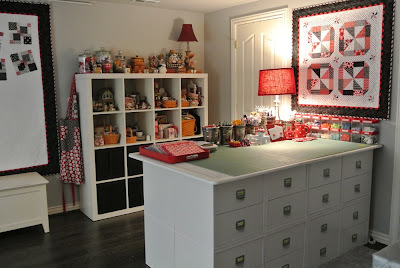 I would love to have a cutting table with drawers for storage IF I could get the height right for me. 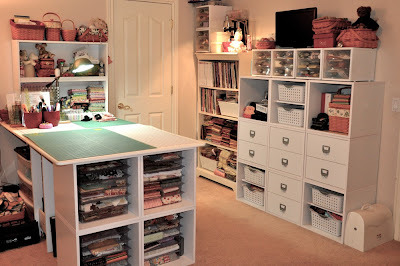 What is the brand of the cutting table in this fabulous room? I have been searching for one like this for some time.